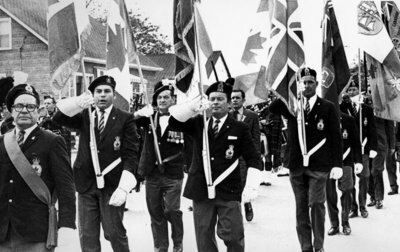 A black and white photograph of a parade at the opening of the Brooklin Legion Hall. In 1967, the Royal Canadian Legion Branch 152, Brooklin, purchased the old Brooklin House Hotel at 26 Baldwin Street. Striking workers at General Motors in Oshawa renovated the old hotel into a Legion Hall in 1970 and it was officially opened on June 6, 1970, the 26th anniversary of D-Day. The Brooklin Legion Branch was founded in 1929 and closed in 1932. It was later revived by barber Fred Phillips in 1966. Brooklin Legion Hall, June 6, 1970, The Oshawa Times. Whitby Archives 25-000-349.